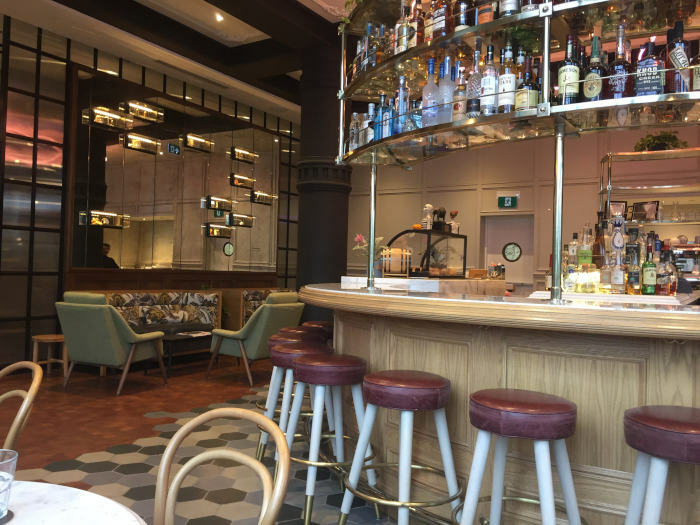 A huge thank you to Visit Toronto, the wonderful staff at the Cluny Bistro & Boulangerie, the Broadview Hotel, the Chefs Assembly, and Culinary Adventure Company for making my trip special! As always, all opinions are my own. 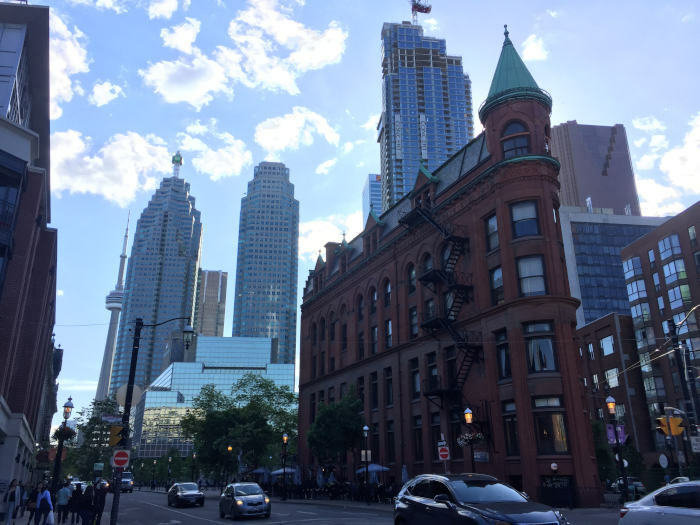 Toronto is the kind of city you can go to a million times, and have a different trip each visit. In need of an adventure? 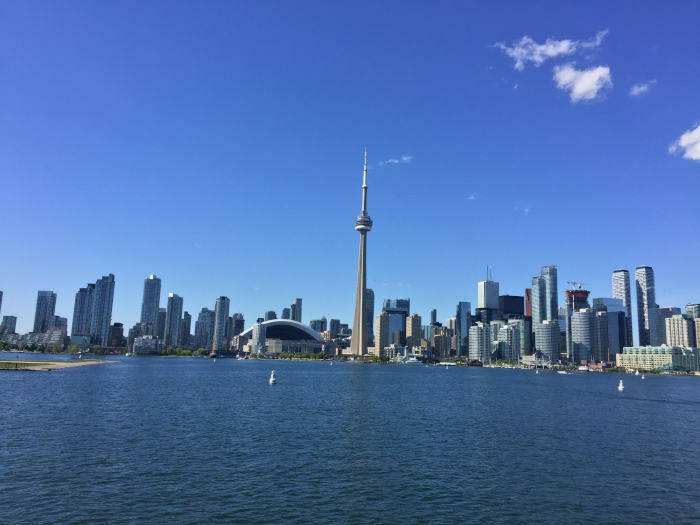 Swim with stingrays at the aquarium or challenge yourself to the EdgeWalk around the CN Tower. Craving a beach getaway in the summer? Island hop and explore during the warmer months. Hungry? Always. 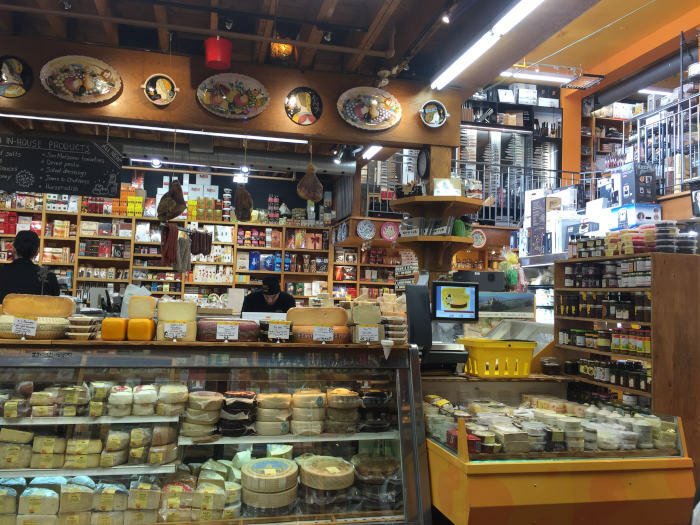 Take a culinary tour and stroll through some of the best markets, food halls, and restaurants in the world all in the same city. 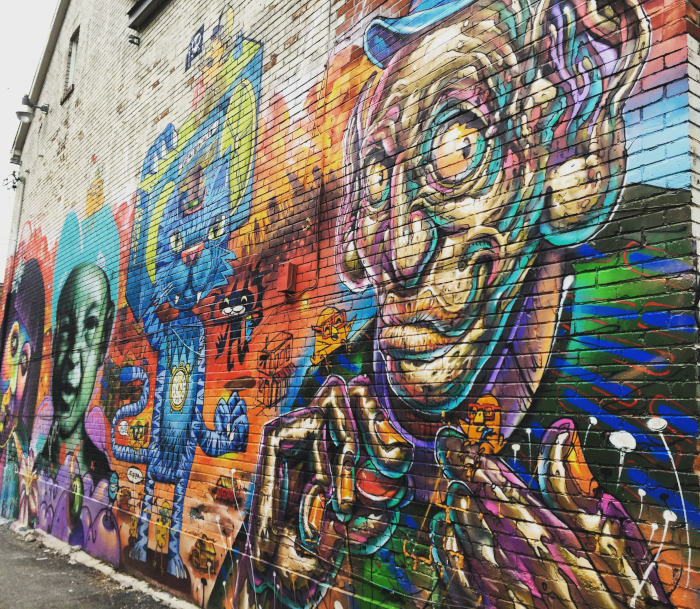 Toronto just simply never gets old and it’s only a short 2 hour drive away from Buffalo! 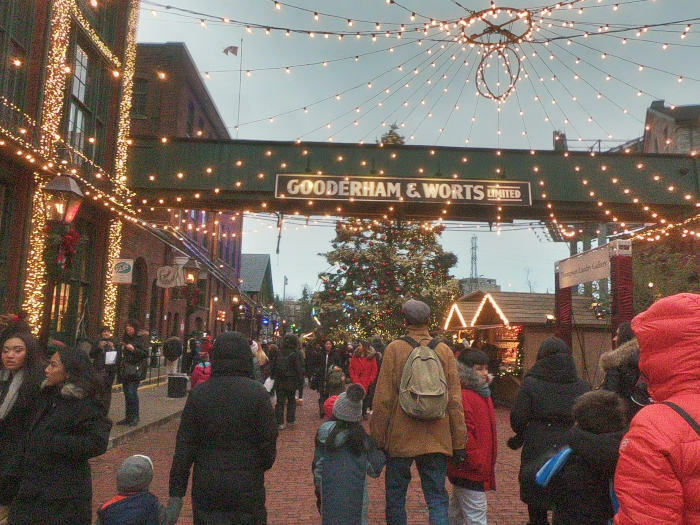 During the holiday season, they feature numerous markets, including their famous Toronto Christmas Market in the Distillery District where the shops are open late and food vendors line the streets with holiday treats. 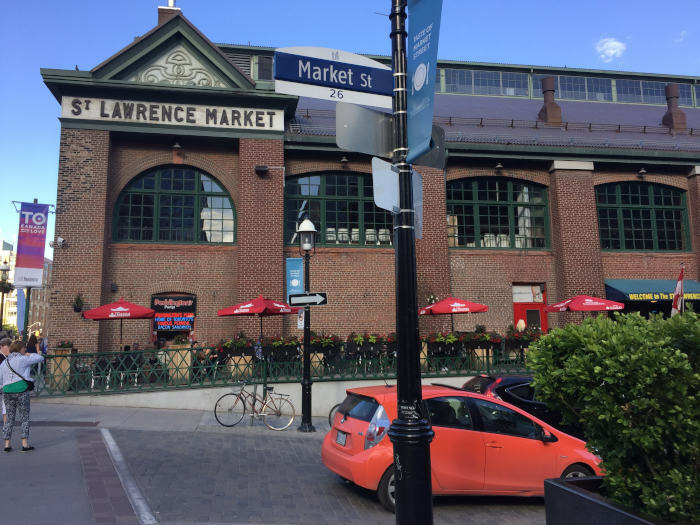 The market is reason alone to make the trip north, but there are plenty of other things to do, inside and out, to fill a 2 day 1 night visit! 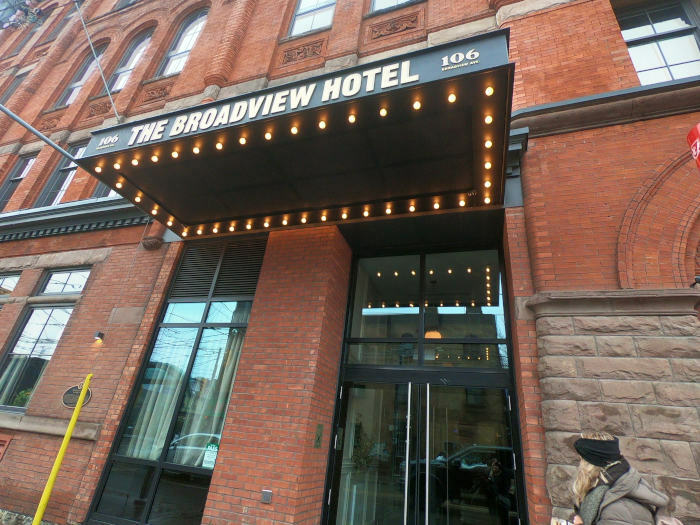 Just off the beaten path is a newly renovated hotel with character and cozy amenities. 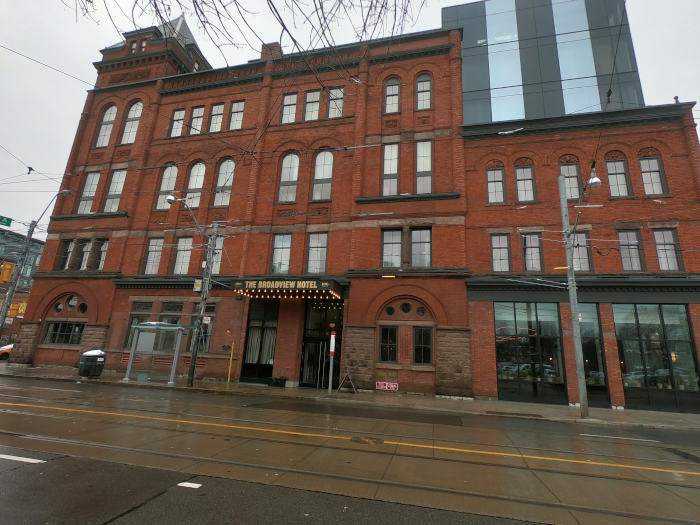 The hotel itself is only just over a year old, but the building has been around since 1891 in the historic east end of the city. 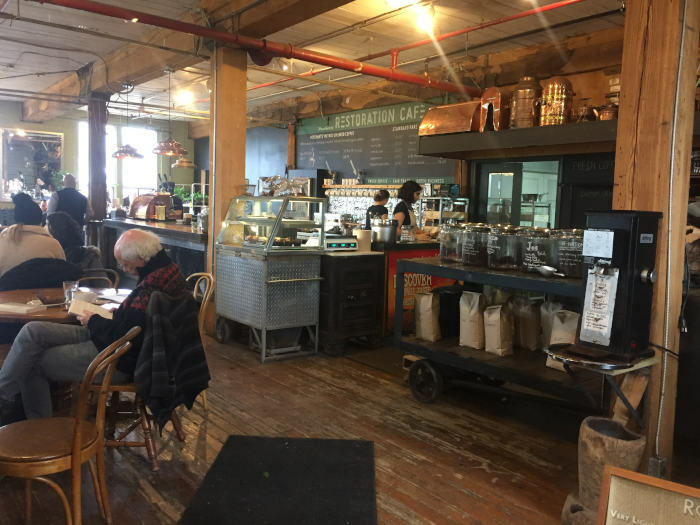 As soon as we stepped inside, I noticed the beautiful bar to the right and the employees were so friendly and helpful, immediately asking what are plans were to explore with city. We were just going to ask if they could store the luggage, but they offered an early check-in allowing us time to get situated before heading back out. Of course that’s not always a guarantee, but they were willing to accommodate us in anyway. 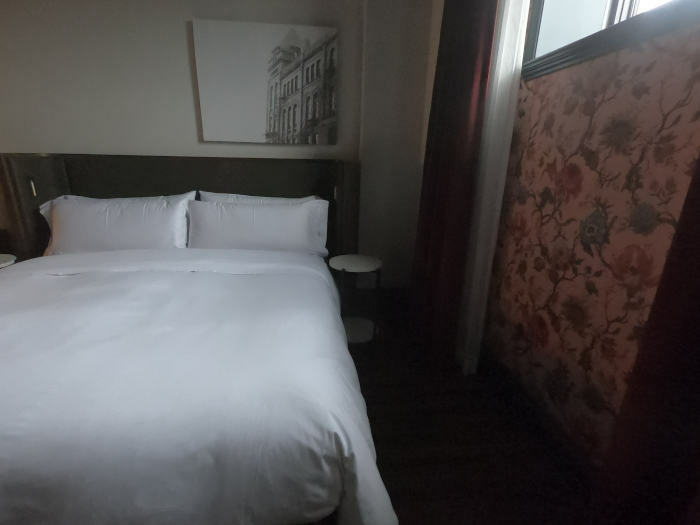 We stayed in the king traditional room with, of course, a king size bed with luxury Italian linen. I’ve officially decided I won’t accept anything less from here on out because those sheets were so cozy and warm. The record player in the room was playing soft music and the beautiful light pink floral wallpaper was a nice touch, perfect for photo ops! 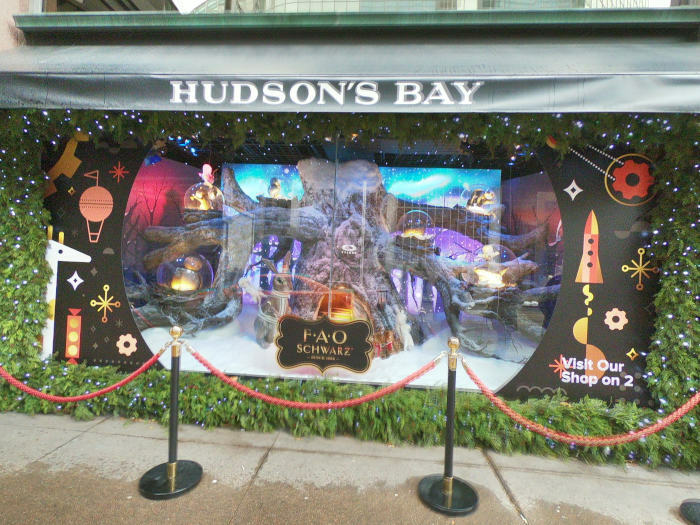 After getting settled into the room, we called a taxi to take us to the Hudson Bay area where we landed right in the middle of some holiday decorations you’ll definitely want to see! 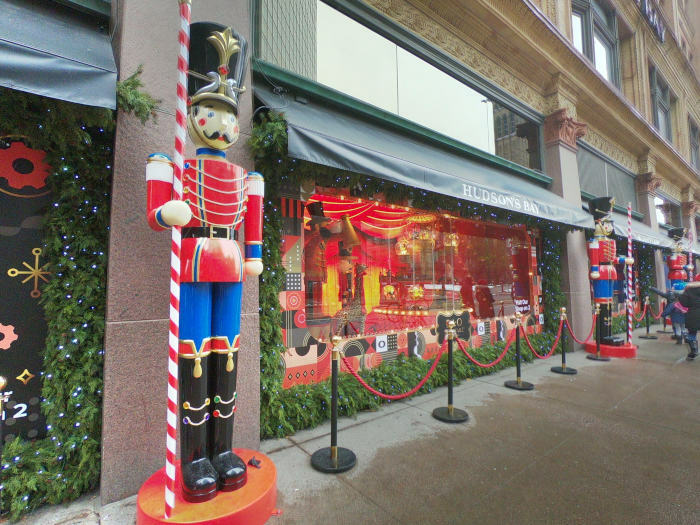 Start by exploring the iconic holiday window displays at Saks Fifth Avenue where you’ll see nutcrackers, winter wonderlands, and even a narwhal. Epic. 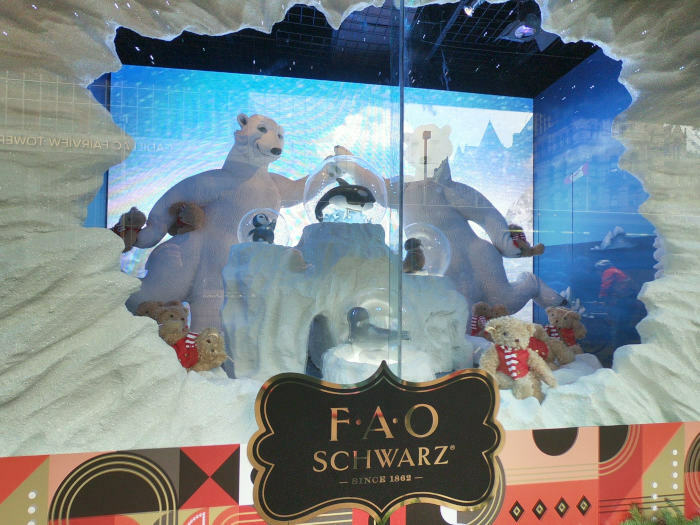 See a window display you absolutely love? Take it home in a snow-globe! 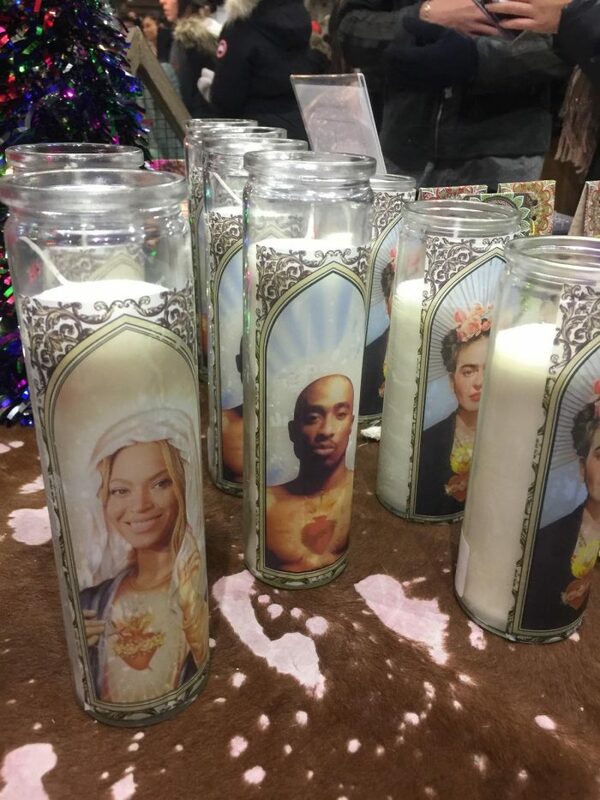 They’re on sale on the bottom floor of Saks. The store is notorious for having 8 floors of designer clothes, shoes, and perfumes, but if you weren’t banking on a splurge this trip, they have a great, and very affordable, home goods section on the ground floor. 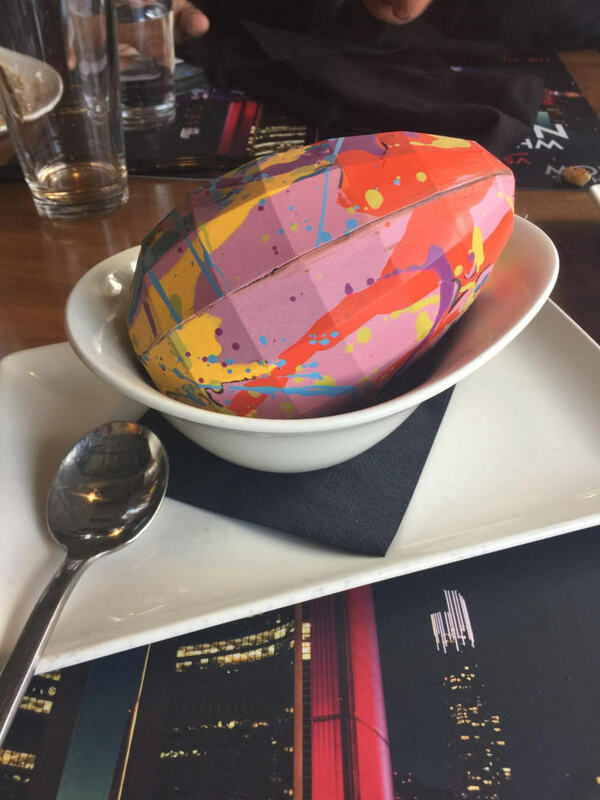 Speaking of the ground floor of Saks, there’s even a food hall down there where you can get candies, oils, chocolates like the famous disco eggs from CXBO, and poutine, of course. 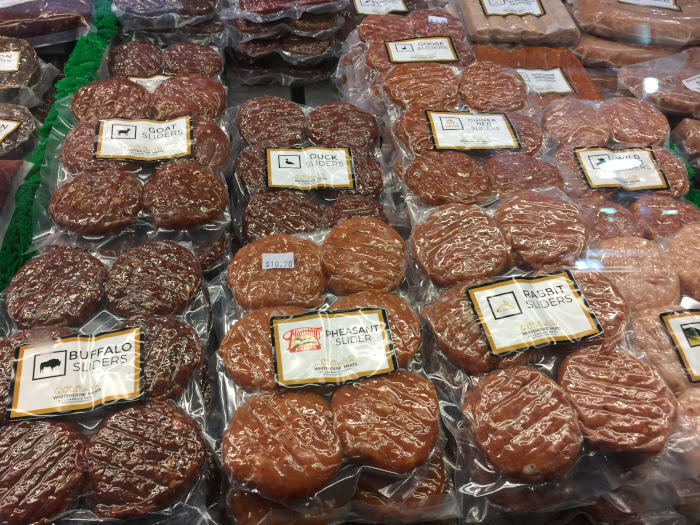 You need a snack to shop, right? It’s fuel! 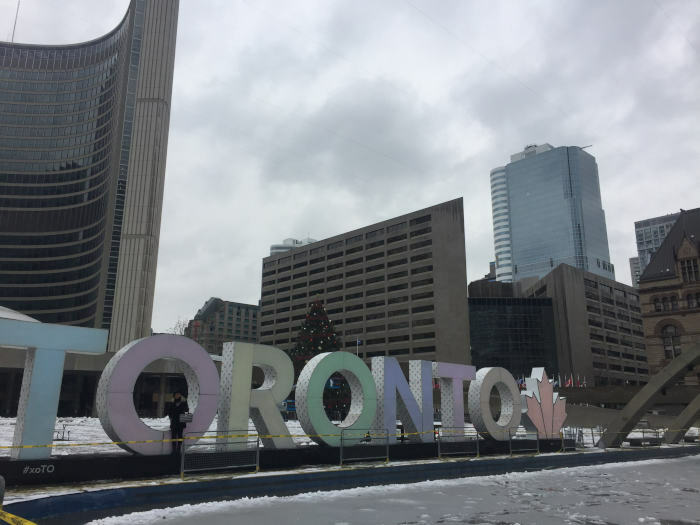 After Saks, walk over to the Nathan Phillips Square where you’ll see Toronto’s City Hall building, the famous Toronto sign, and the Christmas Tree. The tree is up and workers were prepping the ice, getting ready to kick off the 52nd Annual Cavalcade of Lights that takes place the Saturday after Thanksgiving. At the event, they’ll light the famous tree in the square and have musical performances, skating, and more! 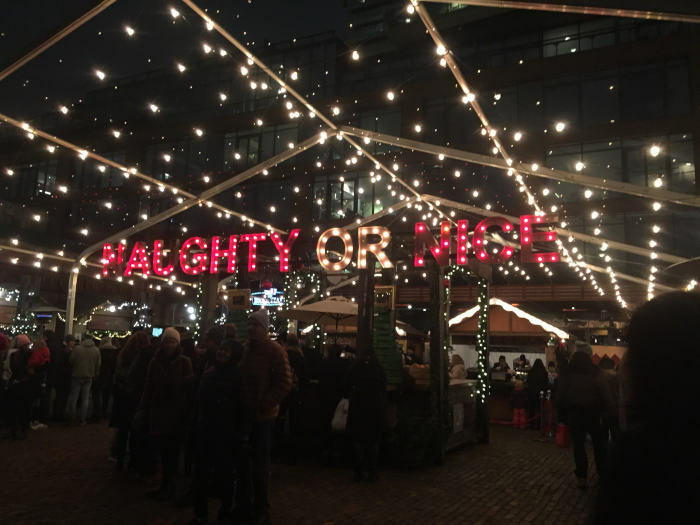 Nathan Square is also home to the Holiday Fair Nathan Phillips Square where you can shop for unique gifts, enjoy carnival attractions, and even sip on seasonal cocktails at the ice bar from December 1-23, 2018. I’m not one to seek out malls when traveling, but for the Eaton Centre Christmas Tree, I’ll make an exception! 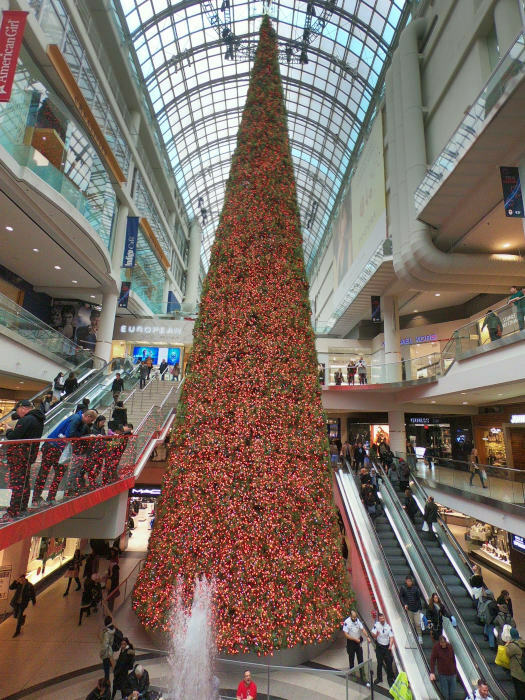 This 100 foot Christmas tree in the Toronto Eaton Centre is so extra, you need to see it to believe it. Decked out in twinkling red lights, this tree is boujee beyond belief and deserves a photo at the very least. It’s stunning! I’m going to try to remain calm, maintaining my dignity, while I talk about this place. Walking distance from the windows at Saks and the Toronto sign is a foodies version of heaven on earth. Seriously though, I begged my family to just leave me there. 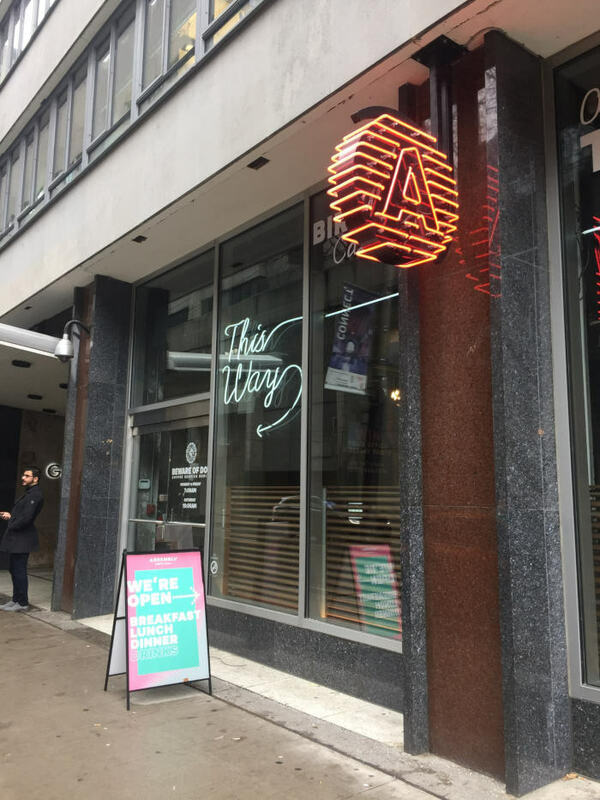 The Assembly Chef’s Hall, just around the corner from Nathan Square, is a food hall in Toronto’s Financial District that brings together 17 of the city’s top chefs, baristas, and restaurant owners in one building. 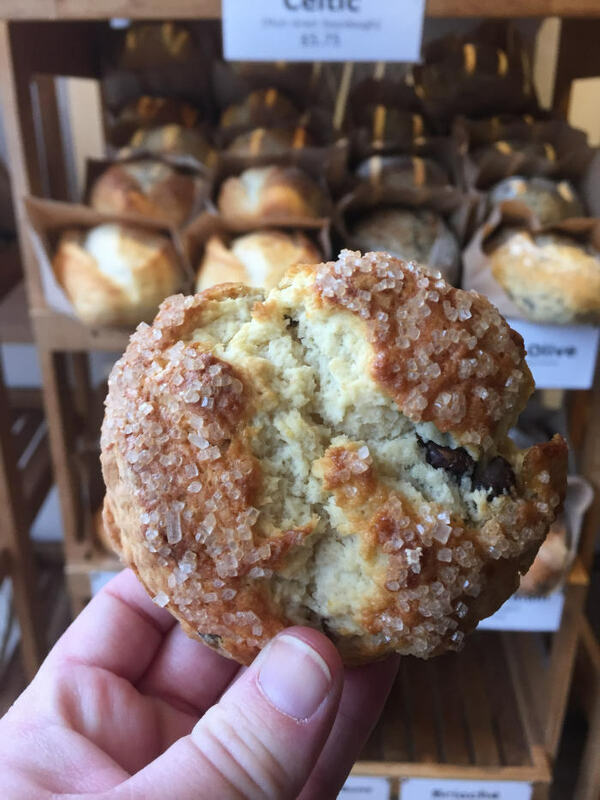 Under one roof, you can taste some of the city’s best dishes and experience cuisine from all around the world… and incredible cookies the size of your head from Short & Sweet where their slogan is “ruining diets since 2009.” I believe it. 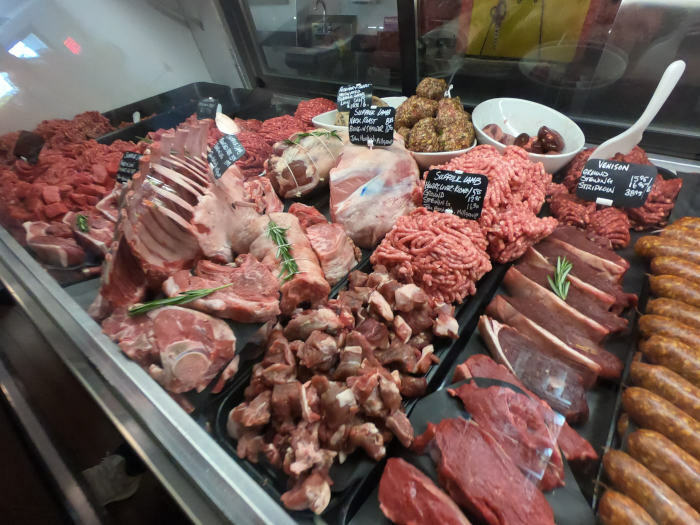 Not knowing where to even begin, we scanned each stand carefully, then just started ordering a bunch of different things to taste and share. Best way to do it by far! Starting with the baja fish tacos from Colibris, where they make absolutely everything from scratch, always. 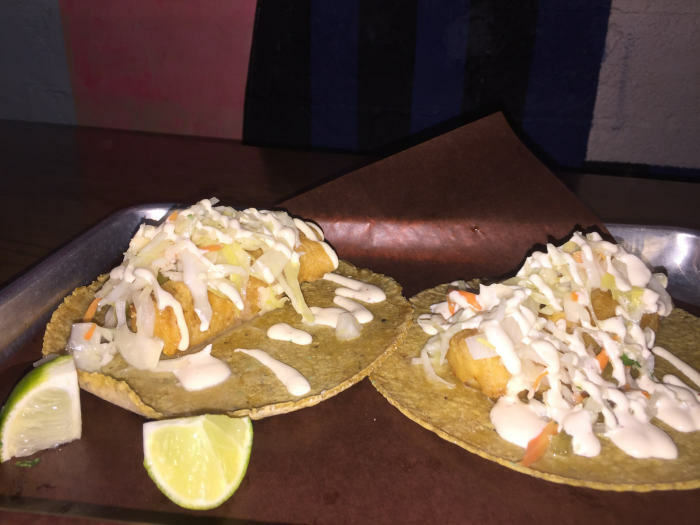 The battered fish was crispy and juicy, covered in pickled cabbage, matcha cream, fresh lime juice, and veggies on their thick, homemade corn tortillas. 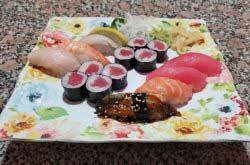 Wonderful blend of flavors and textures. Unbelievable! 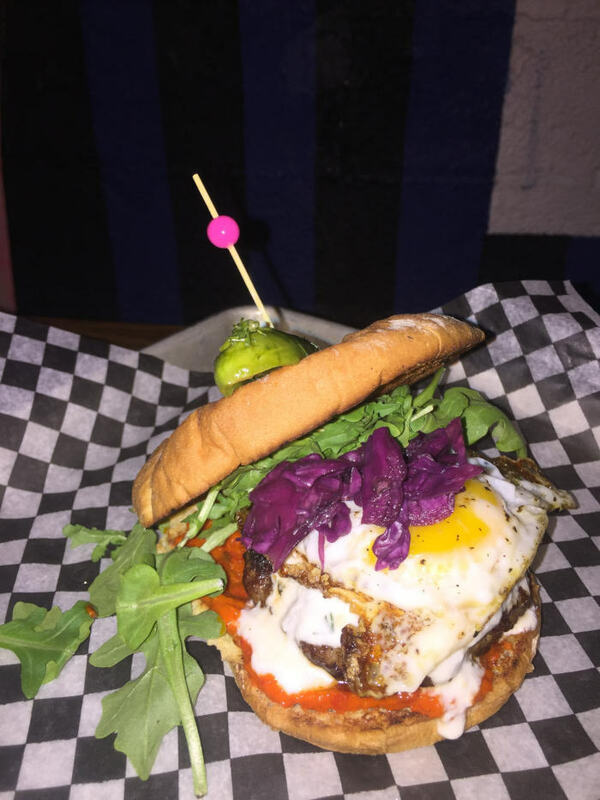 The tender lamb burger from Mira Mira was as visually stunning as it was tasty, covered in a runny yolk egg, black pepper creamy yogurt, red pepper aioli, red cabbage, and fresh arugula. 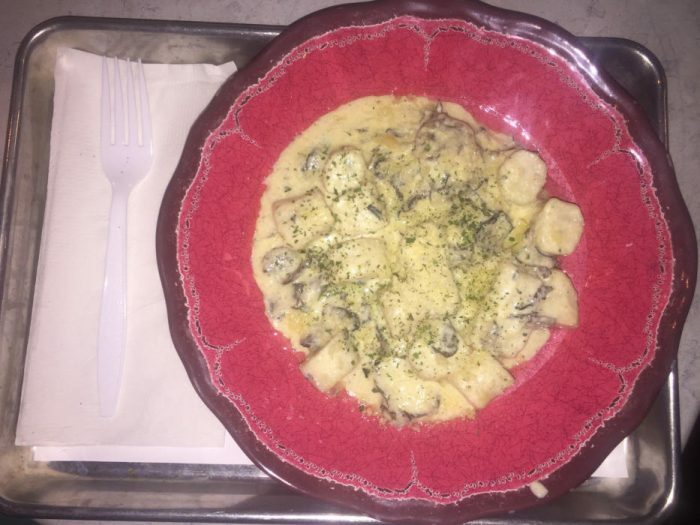 The boho truffle gnocchi from Resto Boemo that beat Bobby Flay on the famous Food Network show was so soft and pillowy, the creamy truffle packed bites practically melted in your mouth. One of my favorites, by far! 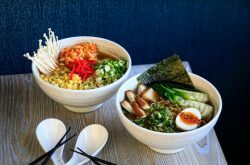 Chef Nick Liu, who recently competed on Iron Chef Canada, is the man behind DaiLo that serves asian cuisine. 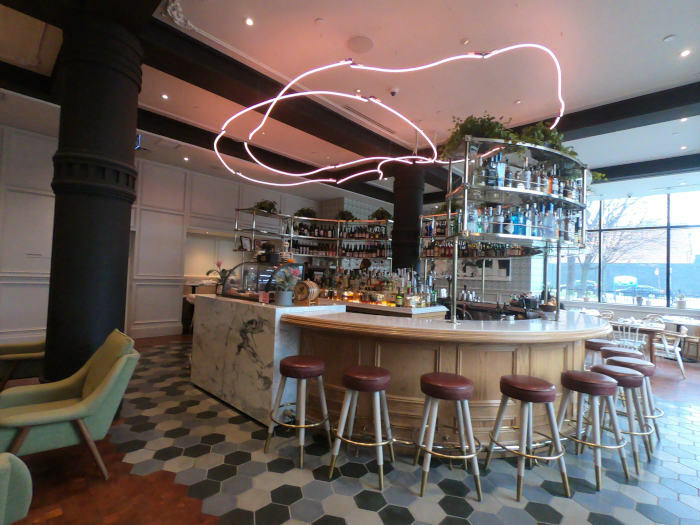 The critically acclaimed DaiLo consistently lands on the Top 100 Best Restaurants in Canada list, so we knew we had to try at least one dish from there! We went with an order of their crispy peking glazed confit duck wings with duck pancakes and cucumber scallion. 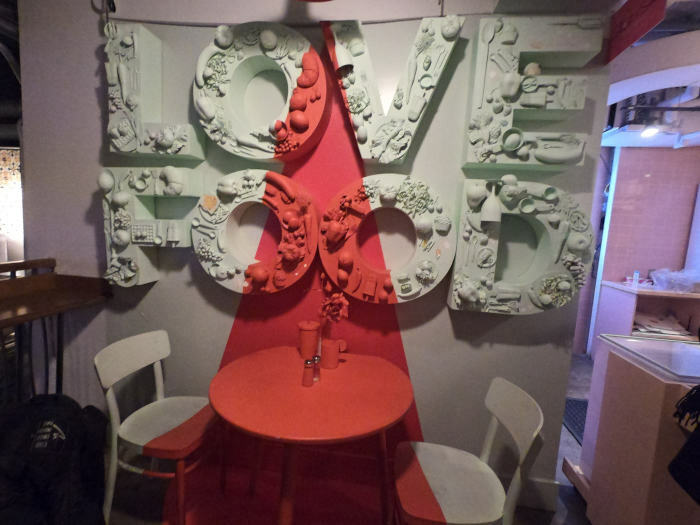 You can’t leave a place like this without dessert, right? Short and Sweet cookies has a variety of treats, including their giant, buttery cookies! The magic cookie with pretzels, marshmallow, cornflakes, ruffles, and chocolate chips was the perfect blend of salty and sweet. 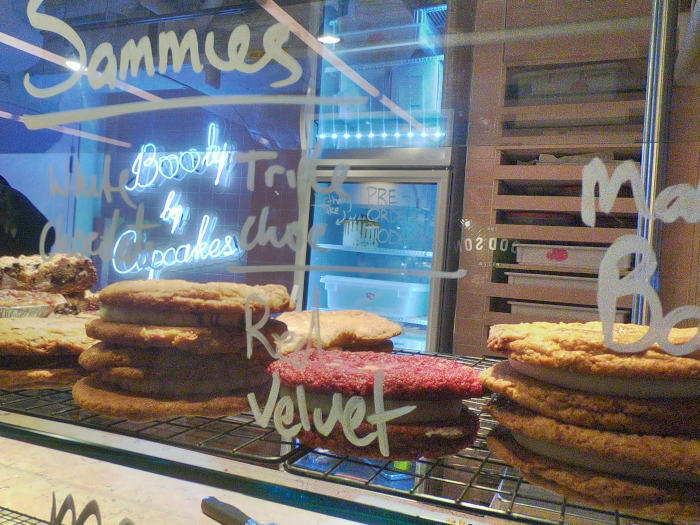 The sammies the size of your head are a must buy! We went with the red velvet, and it was the perfect end to an amazing feast. 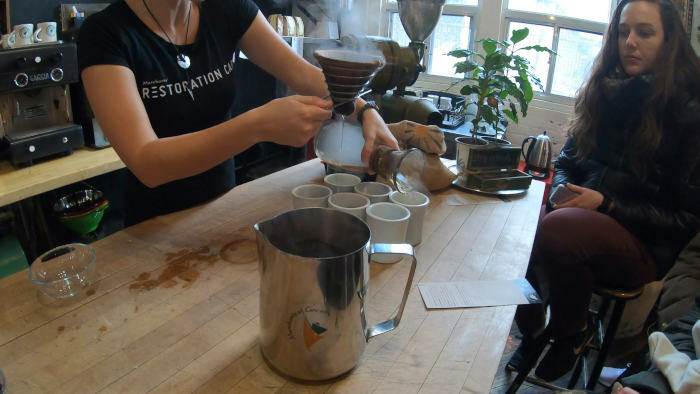 We washed our cookies down with some coffees from Nutbar, where they make their own nut milk from organic cashew, almond, and coconut. 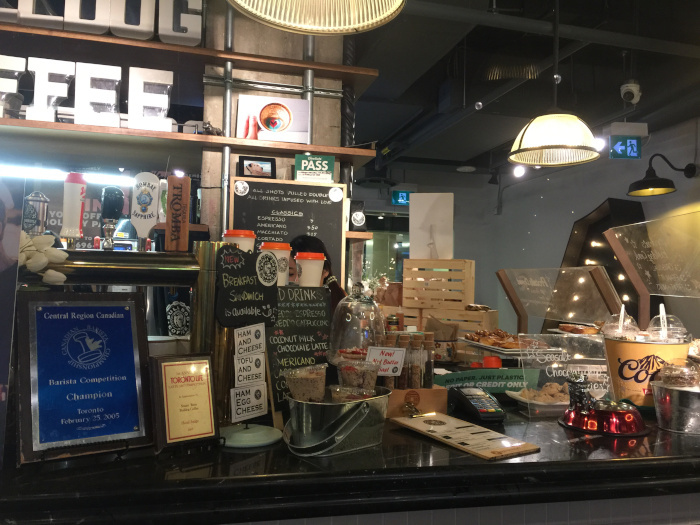 The turmeric latte made with their steamed nut milk, black pepper, turmeric, cinnamon, vanilla, and raw honey is definitely worth a cup to go! On the way out I noticed that Bulldog Coffee does a rainbow latte, that I would’ve ordered if I wasn’t already so full and caffeinated. Your Insta feed needs that rainbow latte! 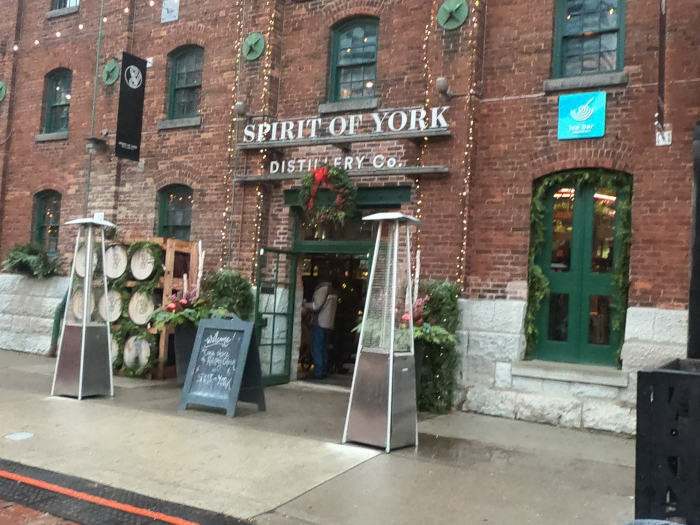 After lunch, we grabbed a Taxi to the Toronto Christmas Market in the Distillery Historic District (free during the week and $6 on the weekend). 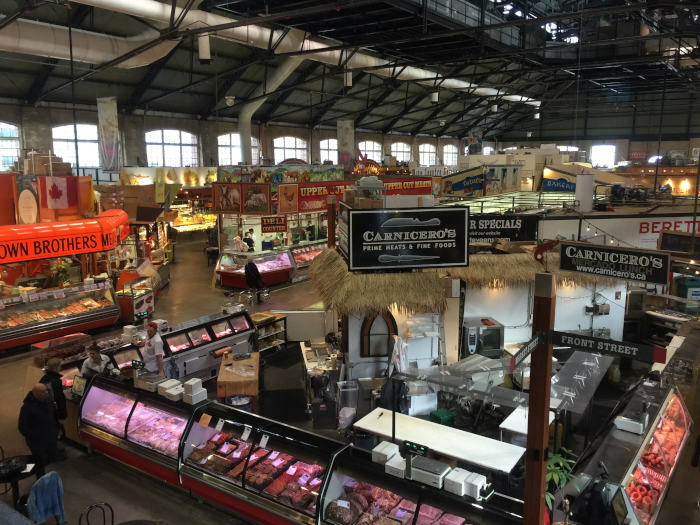 The market got its inspiration from the European Christkindlmarkt that began in the 1400s in Germany. 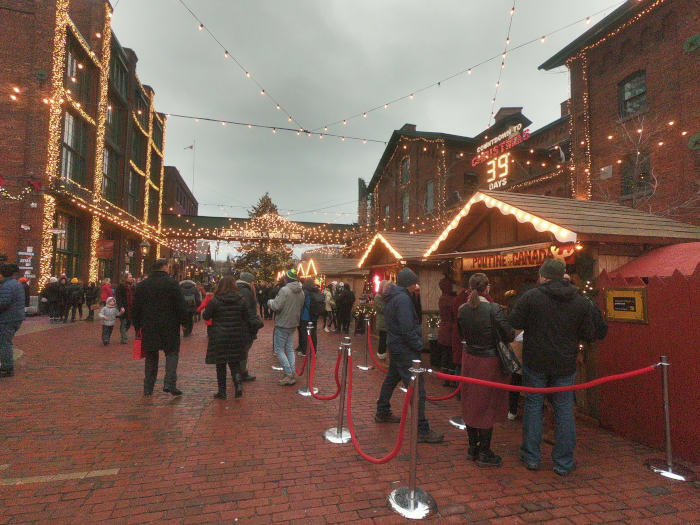 The cobblestone streets are lined with vendors selling treats, spiced wine and festive cocktails, handmade ornaments, and crafts. 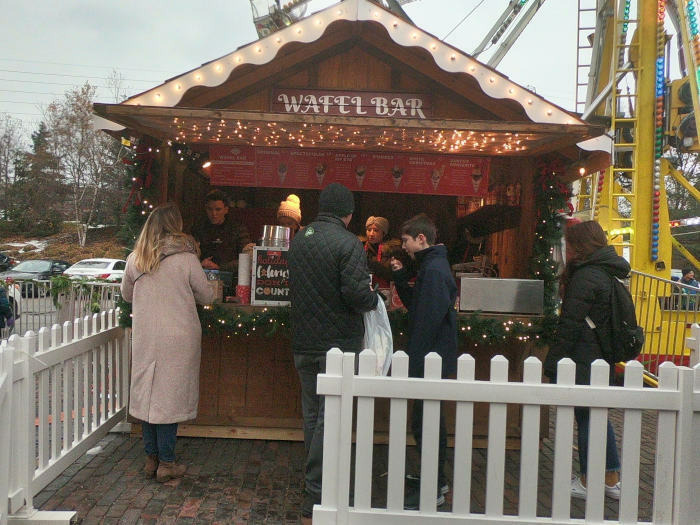 The Waffle Bar near the ferris wheel had hot, soft waffles rolled into a cone and stuffed with fun toppings like marshmallows and gingerbread men. There were giant hot pretzels to soak up some of the beer you’re likely to consume at the Beer Hall in the back near the Naughty and Nice sign, where you can take a seat by the outdoor bonfire pits. I recommend a glass of the “Hopped and Confused” named because although you smell and get the flavor of hops, it’s not bitter. Music fills the air as carolers stroll by and you’ll begin to think you fell into the set of a Hallmark Christmas movie. 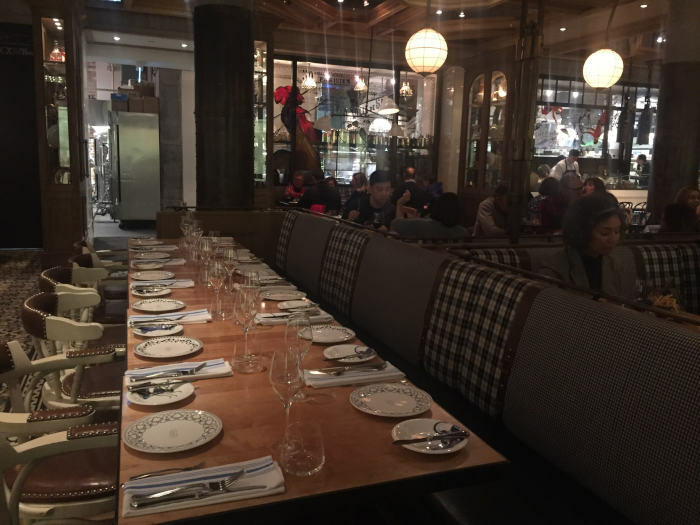 Once we finally got our appetite back, we stopped for dinner at Cluny, an upscale restaurant inside the Distillery District. 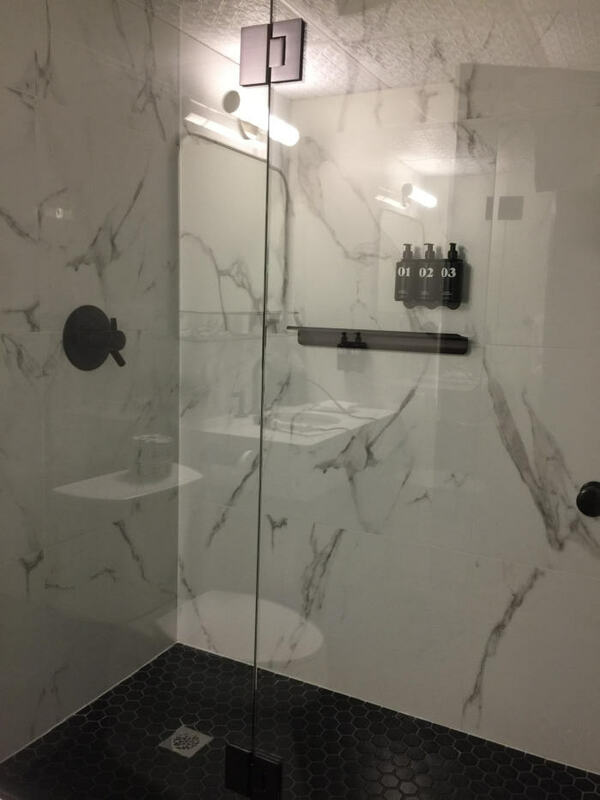 At first glance, we could tell it was going to be a special experience. 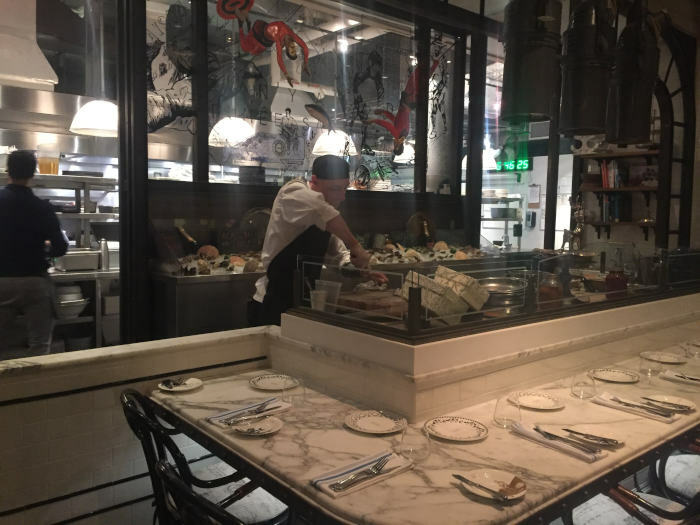 As we were being guided to our table, I noticed a chef shucking oysters behind the raw bar for the huge, smoking seafood towers the waitresses were delivering to nearby tables. 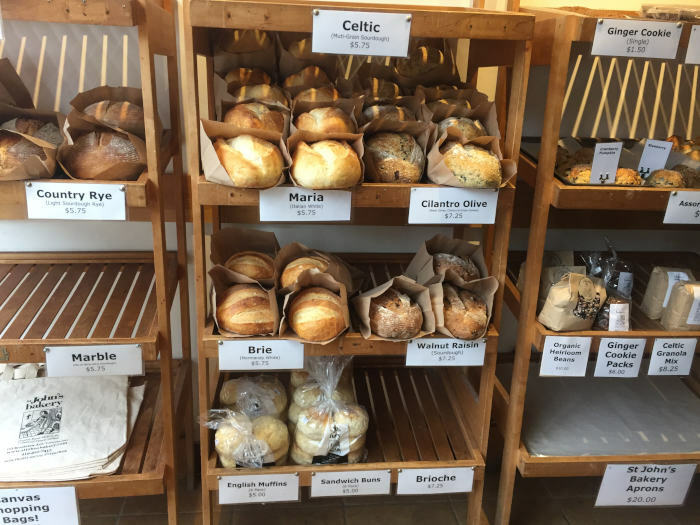 In the middle of the room was an island with loaves of fresh bread being sliced and placed in baskets for guests to enjoy with their meal. 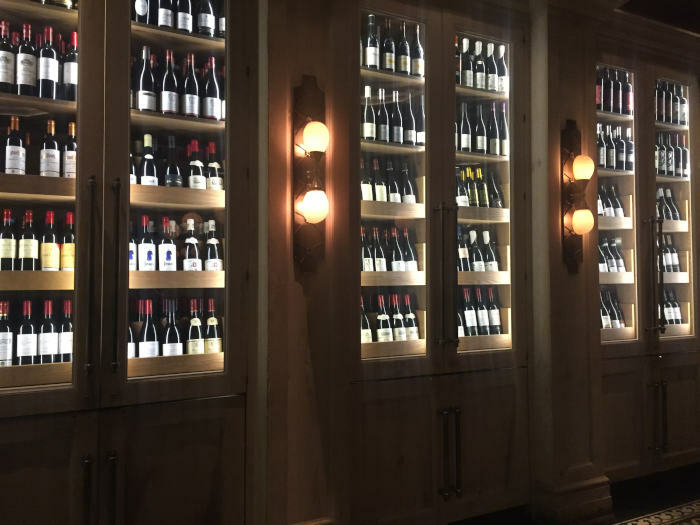 The open kitchen concept allowed customers to see what the chefs are doing behind the scenes, almost like watching the Food Network, while you sipped wine and decided what to order. The atmosphere immediately made an impression. A very elegant one! Our waitress, Brooke, was attentive and helpful from the moment we sat down. Her passion for the food they serve came out as she offered us suggestions of what to try, and she didn’t disappoint! 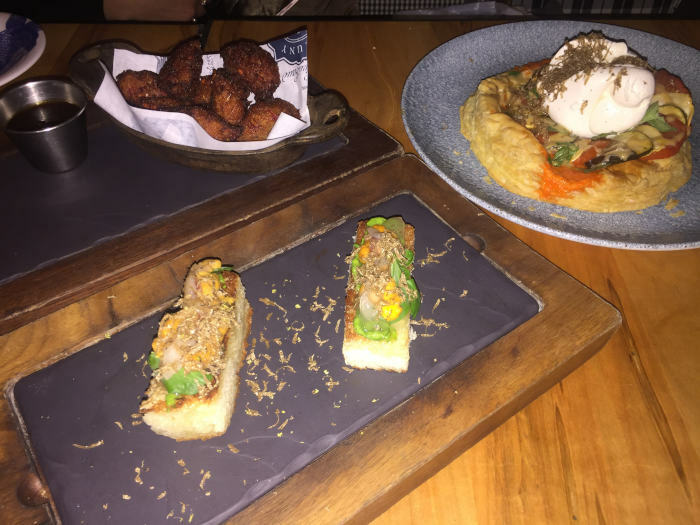 With decadent options like roasted, buttery bone marrow, earthy escargot, and bouillabaisse (fish stew) with smoked clams and confit oysters, it was difficult to choose just a few appetizers to start with. 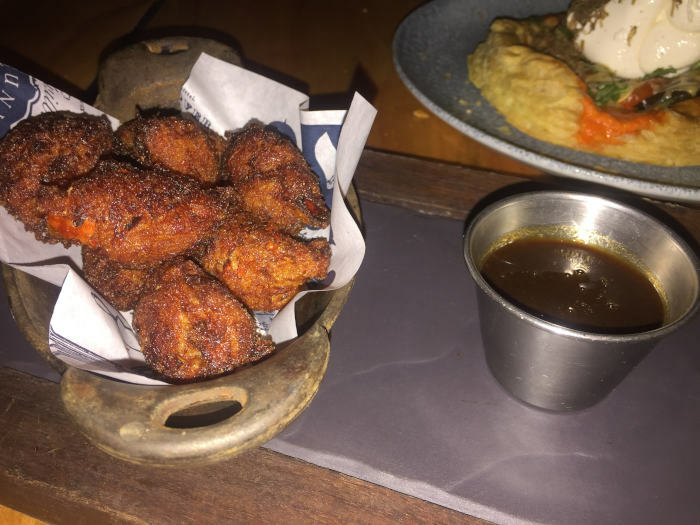 After we ordered our wine, we decided to try their salt cod donuts with a seasoned tamarind compote. I wasn’t too familiar with what tamarind, but learned that it has a slightly sticky, almost syrupy texture with an acidic flavor and it comes from a pod of a tree. The urchin toast was made with rich Pacific sea urchin, watercress and almond pesto, pea shoots, black truffle, shaved local lardo (cured fat), and brioche. 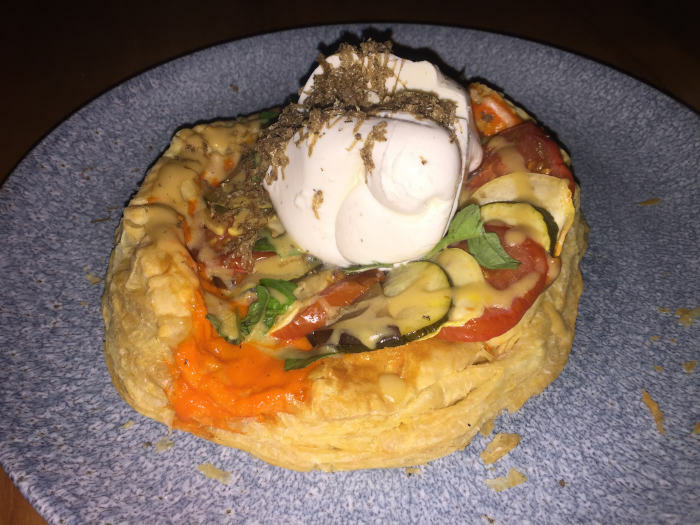 The burratini deep dish has a round puff pastry base with tomato, stretchy Buffalo milk cheese, red onion, and a generous amount of shaved black truffle. 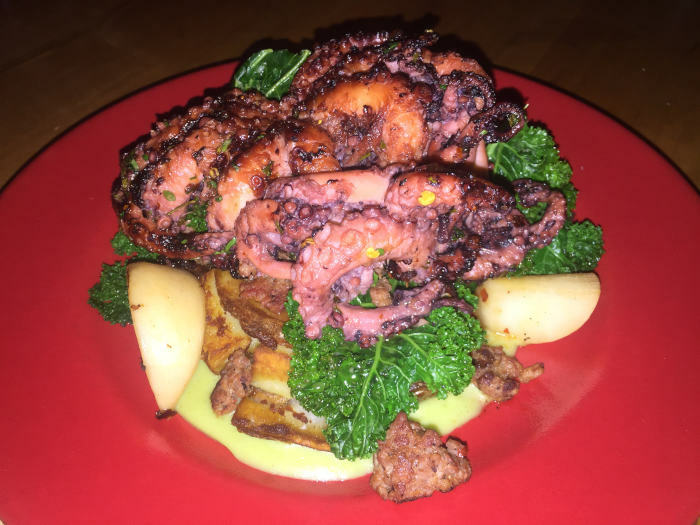 When it came to the entrees, we took Brooke’s wonderful suggestions and went with the steak frites and the charbroiled octopus. 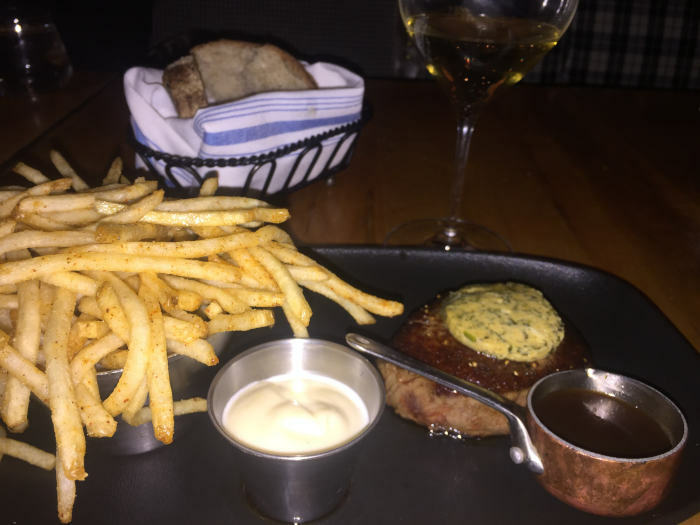 You can choose from a number of different steaks to pair with the frite, liver and onions, or a Perth Farms T-Bone pork chop, but I went with sirloin steak. 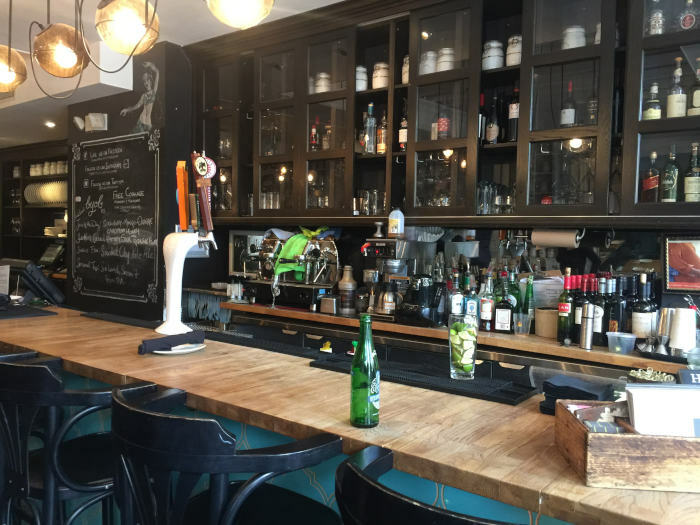 All of their Ontario raised hormone and antibiotic-free steak frite dishes are served with a lemon garlic aioli for dipping your fries in along with a demi glaze and café de Paris butter for the tender, perfectly cooked steak. 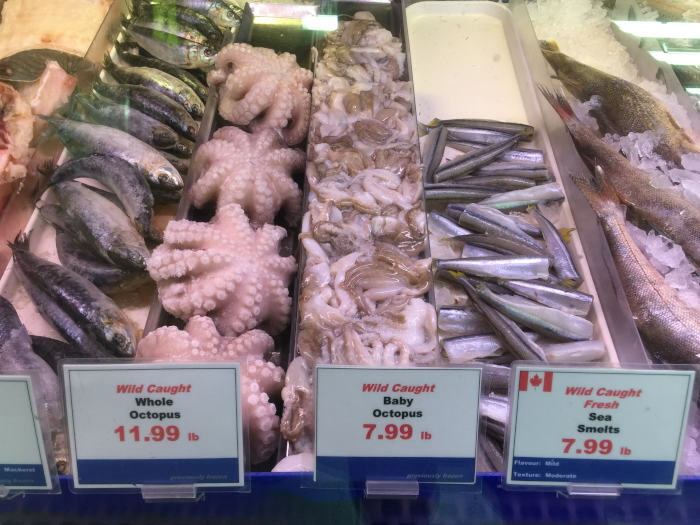 The charbroiled octopus wasn’t fishy or chewy at all. In fact, it actually had more of a mild flavor like chicken with the texture of lobster, so pairing it with andouille sausage gave it some nice flavor. The turnips, crisp potatoes, and sorrel velouté (a kind of buttery, savory sauce) added a heartiness to the dish, and the portions were impressive. There was plenty to share! When you find out the pastry chef has won awards around the world for his chocolate, you save room for dessert. 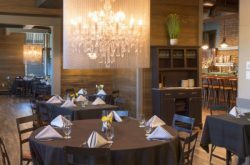 With options like the vanilla crepe flambe lit on fire at your table or the chocolate bombe that you smash open to reveal treats like Pop Rocks, ice cream, marshmallows and more inside, how do you pick just one one? We finally decided on the Kwokolate pot de creme, creatively named after the Pastry Chef, Chris Kwok, who’s chocolate is so amazing that he landed a well deserved spot in the World Chocolate Masters final in Paris. 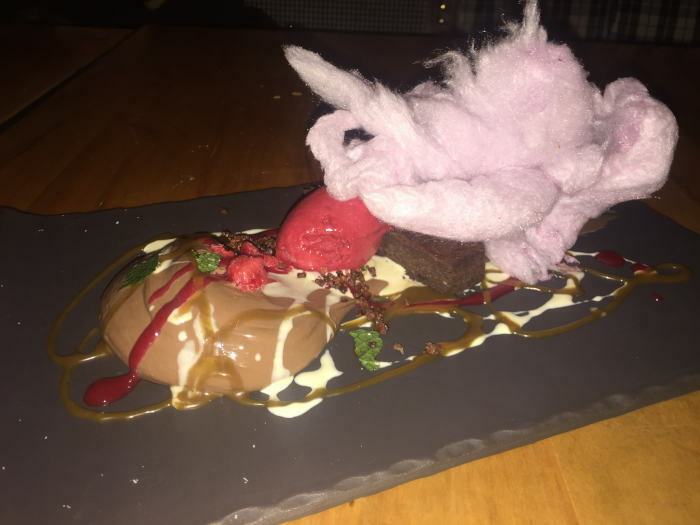 This dessert was great to share with salted caramel, flourless cake, cotton candy, raspberry sorbet with a sprinkle of fresh basil and fresh berries. 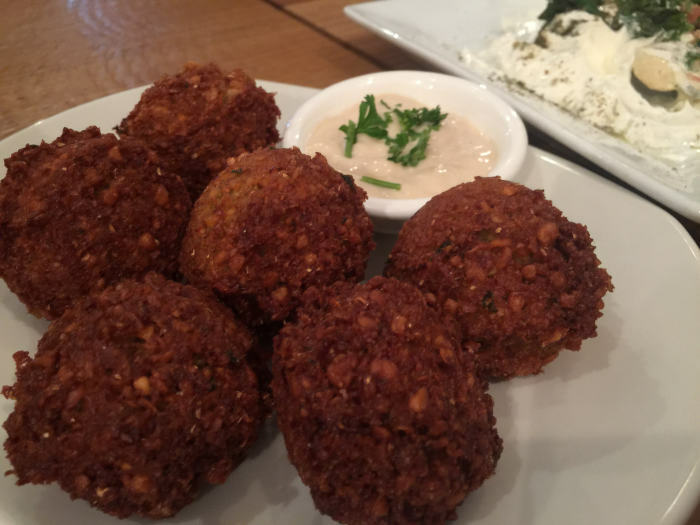 There were so many flavors going on, it was even fun to talk about it, let alone eat it! 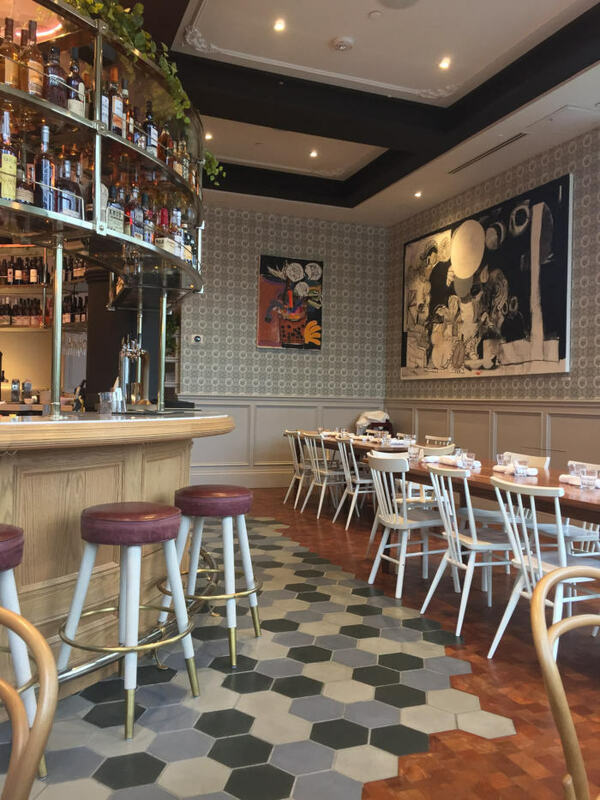 When you ask anyone at Cluny about the team behind one of the most incredible meals I’ve ever had, they’ll say “we’re just a bunch of people who are dedicated to great customer service and making your experience a memorable one.” And that they did. 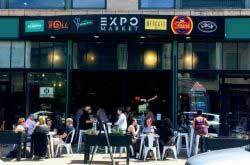 Thank you for creating a dining experience I’ll never forget! 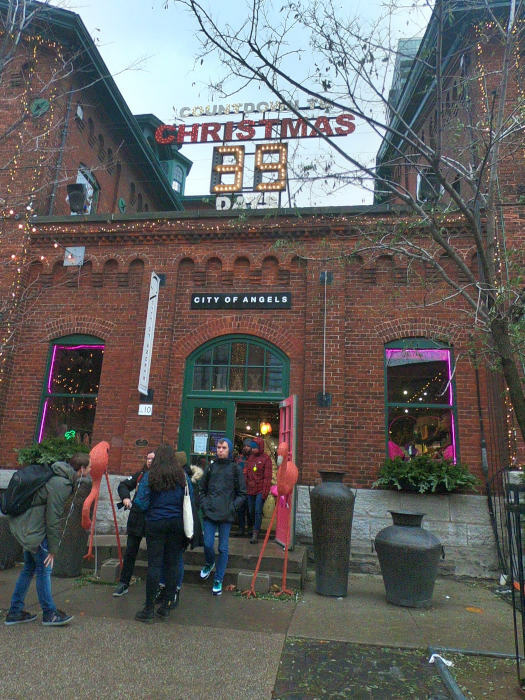 Get one last glimpse of the tree as you’re heading out of the market before taking a cab back to the Broadview Hotel where you can ride the elevator up to the rooftop bar for a cocktail. Take in the spectacular view while sipping your ‘Becky with the Good Hair’ cocktail. 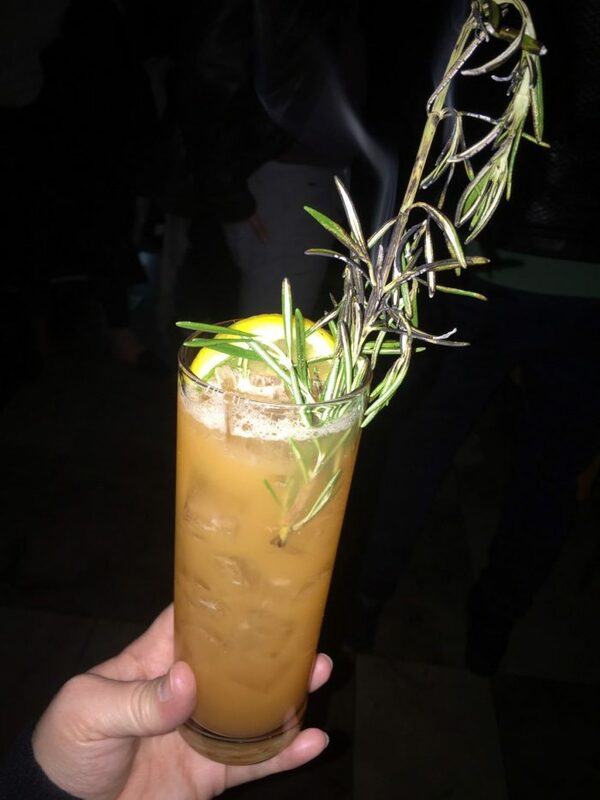 The drink was made with high-quality Grey Goose vodka, carrot juice, coconut water, orange juice, lemon juice, allspice syrup, and rosemary that they lit on fire, leaving strong floral flavors and a slight smokiness in the drink. 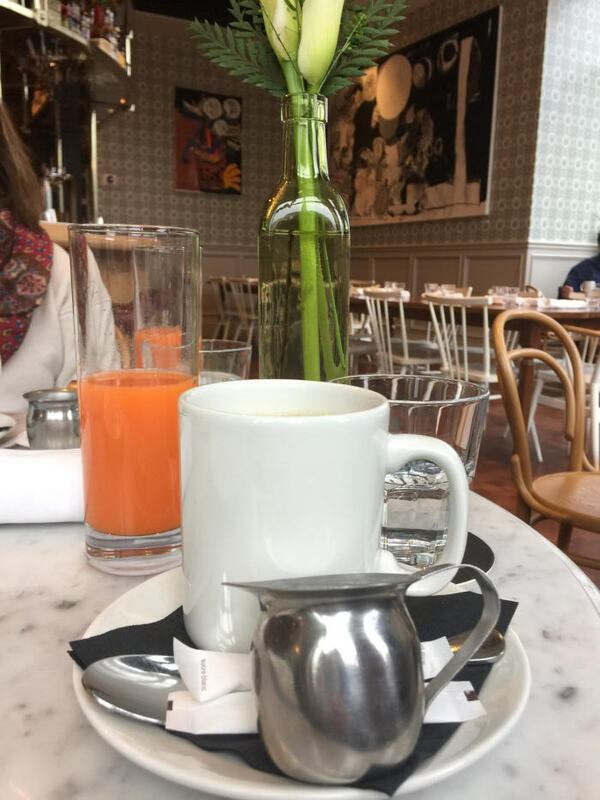 Guests get to enjoy complimentary breakfast in their sun filled cafe, with delicious foods, fresh squeezed juices, and roasted coffee to fuel the rest of your day! 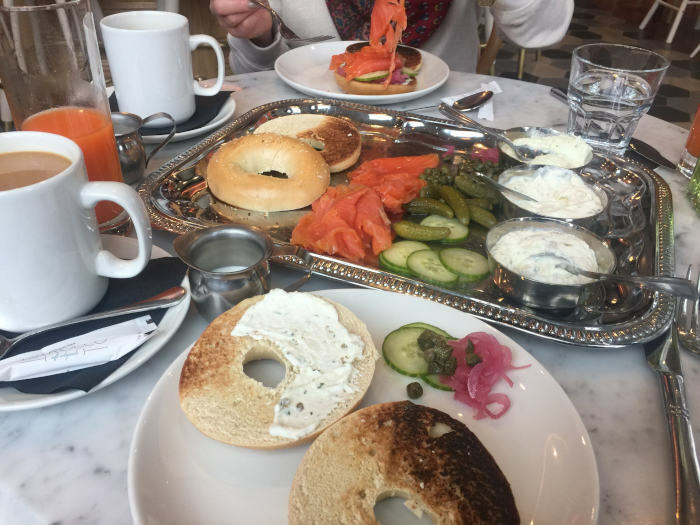 After sipping our coffees and a glass of orange carrot juice (tough call between that and lychee cactus pear juice), we decided to split the montreal-style bagels and lox for two with their house cured salmon gravlax, salty capers, pickled red onion, toasted bagels, cucumber and 3 different spreads. 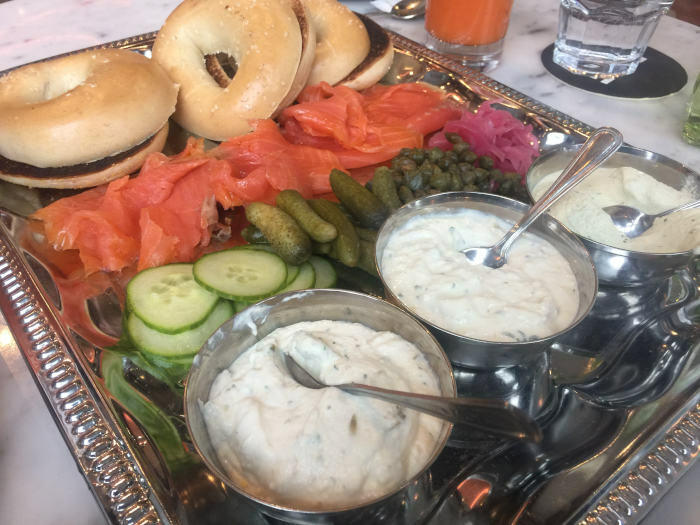 The smoked cod and dill dip was my absolute favorite. It wasn’t fishy, just salty and slightly sweet, but if that’s not your thing there was also a horseradish cream sauce and a lemon dill ricotta. 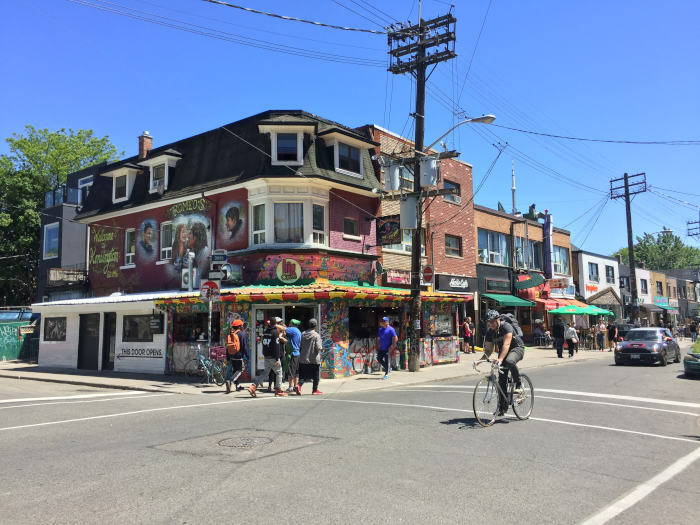 Go light though, because in a few hours after checkout, you’ll head just outside of the hotel where you’ll meet your tour guide to check out some of the best spots in Riverside and Leslieville! 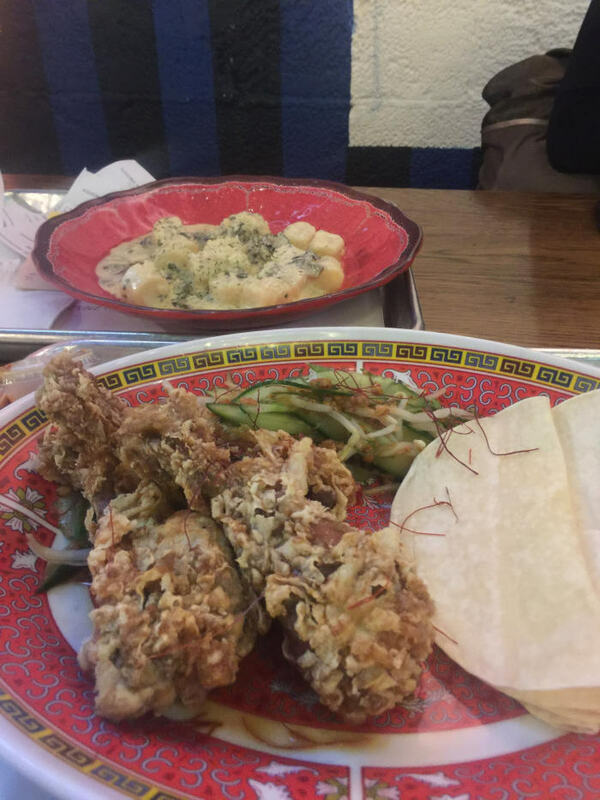 Embark on the 3-hour culinary tour off the beaten path, while listening to stories about the history of the surrounding areas and tasting famous local dishes. 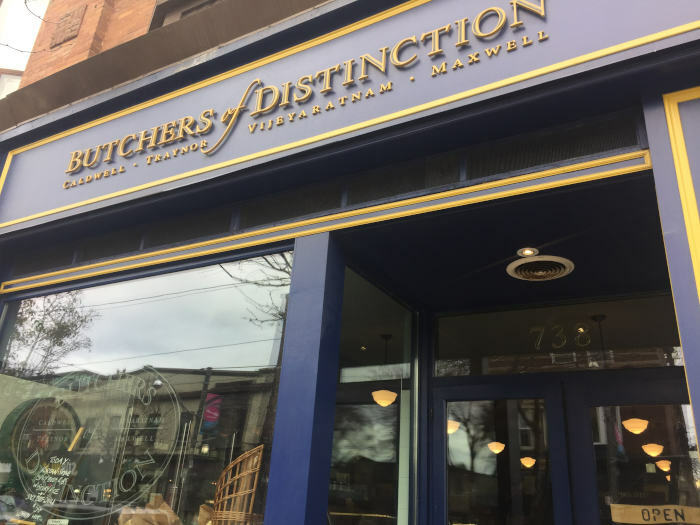 Kevin Durkee, who once owned a restaurant in the city completely dedicated to cheese (come on, what a hero), was an amazing tour guide and had a lot of knowledge about the area! 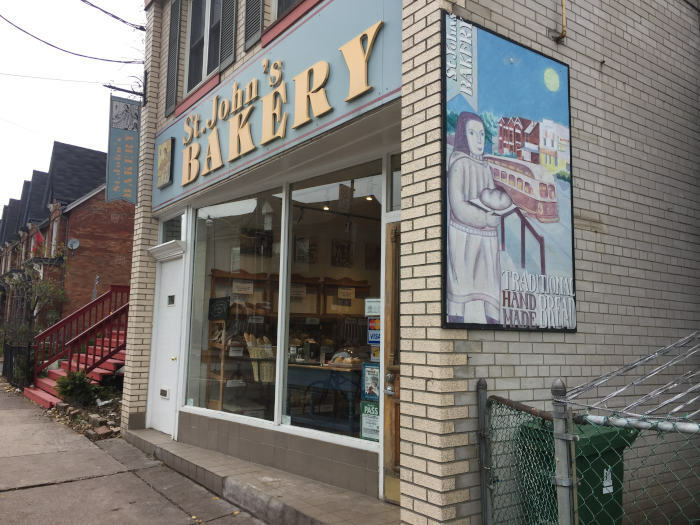 You’ll get to try some fresh bread and scones before they sell out for the day while learning the story behind St. John’s Bakery and their mission to help the community. 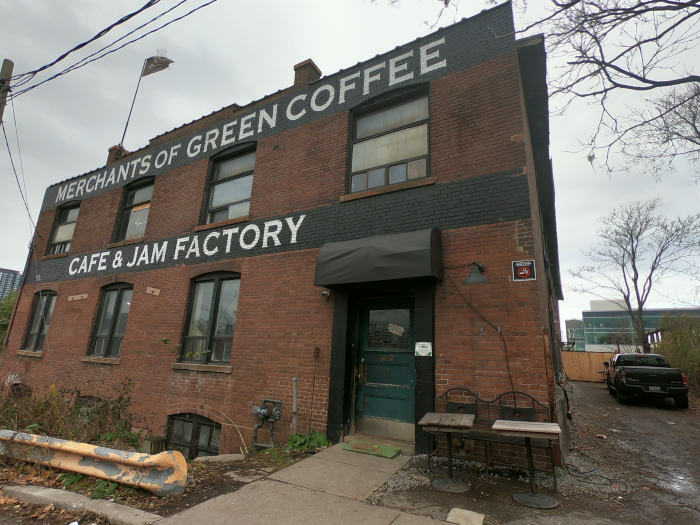 You’ll learn about how to make coffee from the green bean to the cup from the owner of Merchants of Green Coffee. 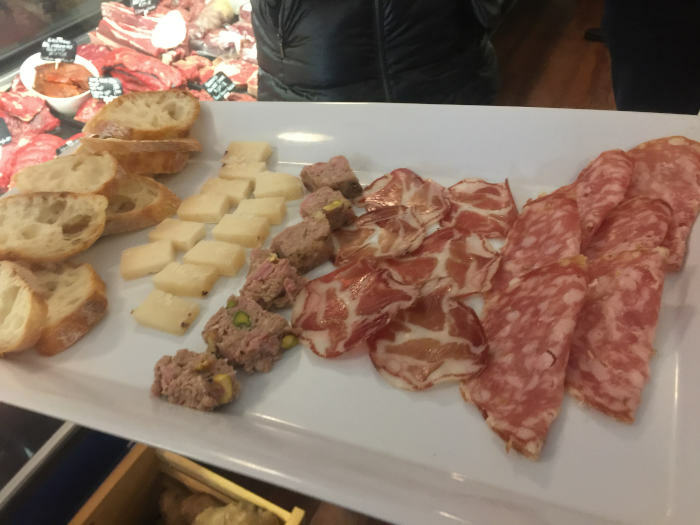 You’ll follow the blue brick trail, signifying that you’re in Riverside, to a local butcher shop where you can taste pork pâté with pistachio, cured meats, fontina, and goat cheese, along with learning the proper way to taste your cheese from the talented guide and cheese expert, Kevin! 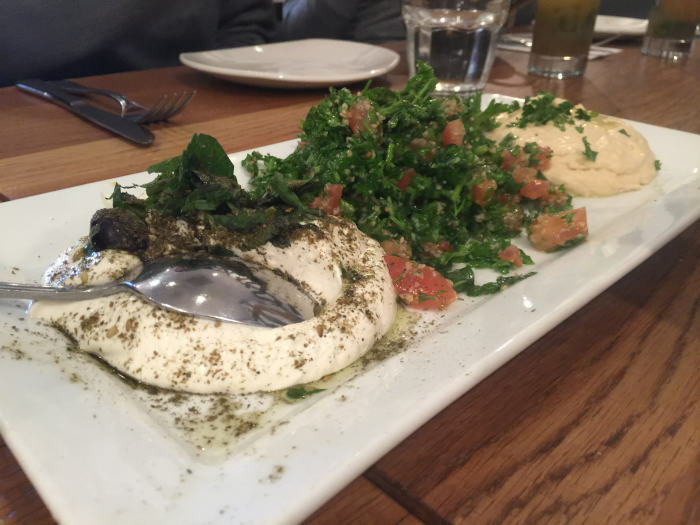 Visit a tucked away haven of the most unbelievable, award winning Middle Eastern food you’ll ever taste. They can take something as plain as an eggplant, and cook it in a way that transforms the inside into a velvety custard and the outside into a thin, crisp layer without it being greasy. Outstanding! 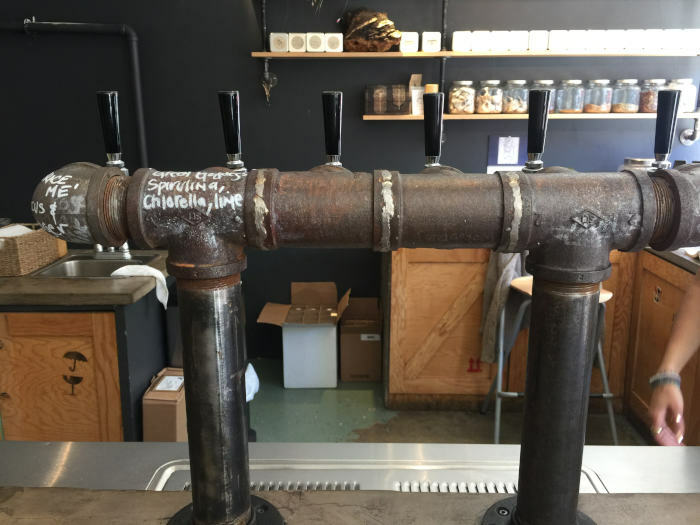 Finish off the tour with a scoop of burnt marshmallow ice cream (or whatever flavor you’d like, but seriously, pick burnt marshmallow… you’ll thank me later) from Ed’s in Leslieville. 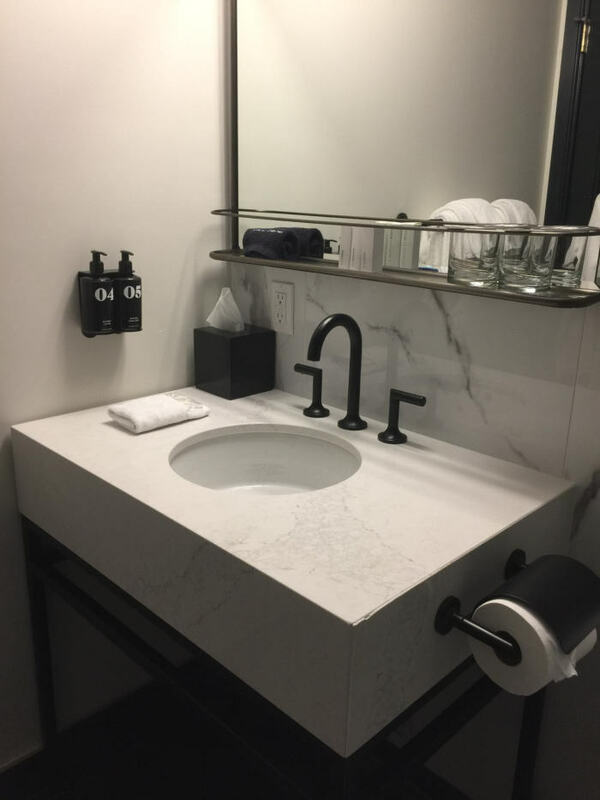 You’re not overly stuffed, but satisfied, when the tour ends and you’ll leave with knowledge of the neighborhood and some great local restaurants to revisit! 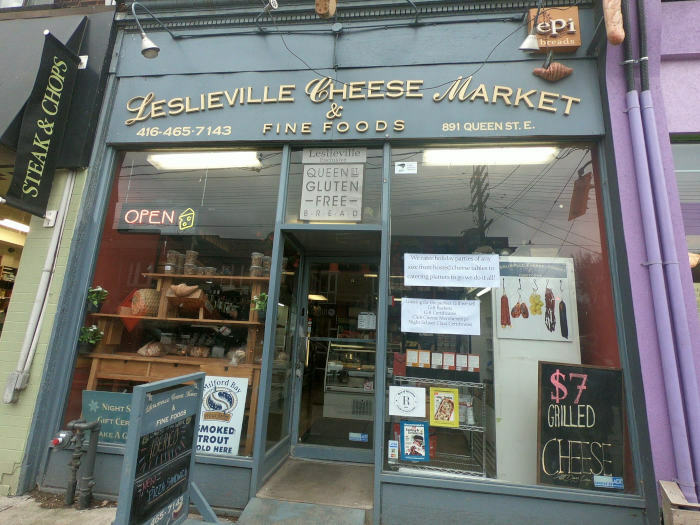 When the tour ends, pop into Queen Books and the Leslieville Cheese Market to see what they’re like before hopping on the street car to visit a few shops on Queen St. West and see Graffiti Alley. 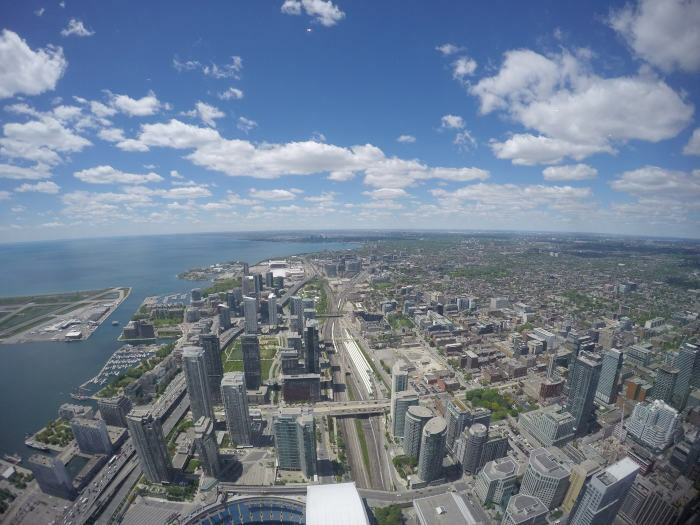 Visit the CN Tower to get spectacular views of the city and watch the brave souls do the EdgeWalk, the world’s highest external walk on a building, during the summer months… or join them. A stop at the Ripley’s Aquarium to ride through the famous Dangerous Lagoon tunnel is a must! You’ll get up close and personal with a variety of sharks and ocean life. At Casa Loma, you’ll have the opportunity to explore the castle grounds of what was once the home of Canadian financier, Sir Henry Pellatt. 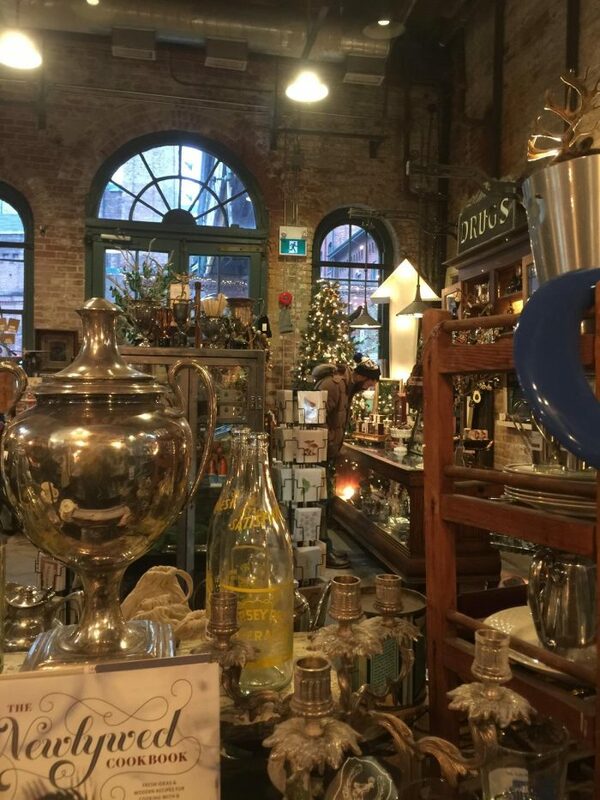 With a city full of incredible markets, you have to make time to see at least one! 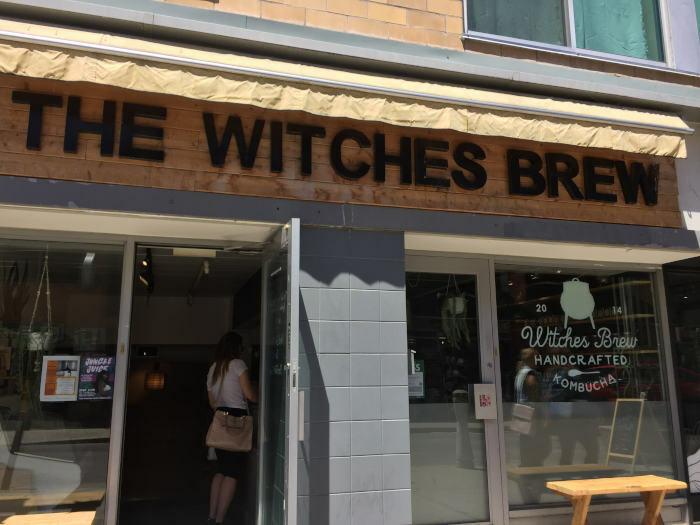 There’s kombucha on tap at Witches Brew in the Kensington Market, a variety of food stations and freshly shucked oysters at the Marché Market, and a wide range of cheeses, candies, and breads at the Cheese Boutique. 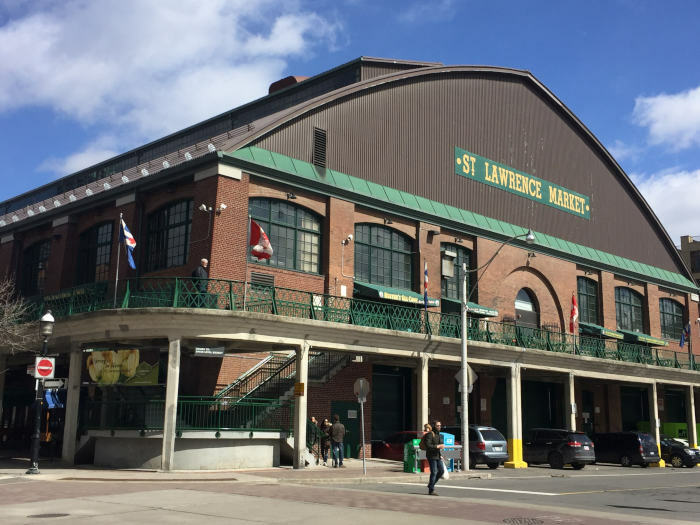 There are so many great ones, but if you only have time for one it has to be the St. Lawrence Market that earned the title of the world’s best food market by National Geographic. They have everything, and I mean everything. 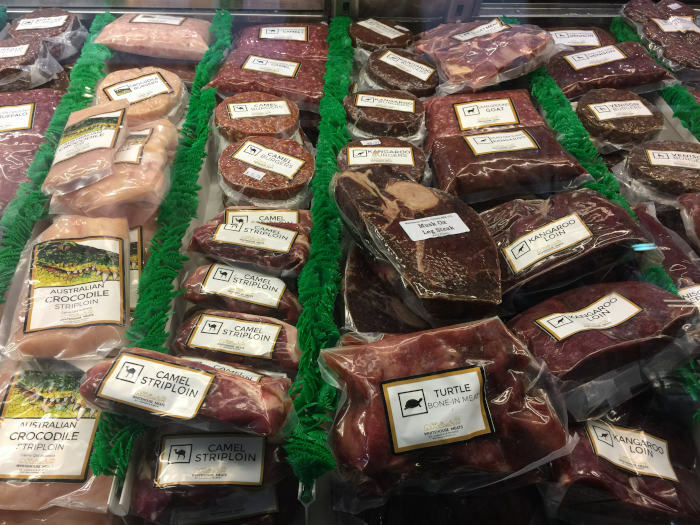 I saw camel, turtle, crocodile and more in their meat department! There were treats, breads, olives, wine, and so much more! It’s definitely worth making the trip to find something to bring home.